1. Practice - Practicing will make you more comfortable when the time comes to interview. Sit down with a parent or friend and have them pretend to conduct an interview. Let them come up with questions to ask you on the spot. They can give you feedback on your answers, body language, etc. 2. Do Research - You should be familiar with the school before you arrive for your interview. Be sure to take a look at the school’s website to brush up on basic facts and to get a feel for each school. You should have a good idea why you are interested in the school, what you like most about the school and why you feel the school could be a good fit for you. 3. What to Wear - Most schools have a dress code, and you should try your best to be in accordance with that dress code on your school visit. If you’re applying to a school that requires a coat and tie, you might consider wearing that yourself. Forget the t-shirts, jeans, shorts, sweatpants and hoodies. You want to show you’re serious about applying and want to be considered a top candidate. 4. Be Yourself - Your admission officer wants to get to know you, the real you. Talk about the things you like to study, your hobbies, your interests, your goals and the new experiences you are looking forward to. Don't memorize prepared answers to then give to your interviewer. Having a genuine and honest conversation is the best way to learn if you and the school are good fit for each other. 5. Ask Thoughtful Questions - It’s important that you prepare some engaging questions to ask your interviewer. You want to demonstrate that you have done your research and that you are invested in getting a strong sense of the school’s culture and community. Don’t ask a question as simple as “how big is your student body?”, dig deeper. 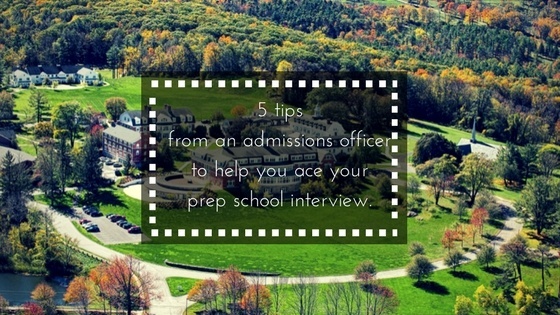 The interview is a valuable piece of the boarding school application process. Good luck!